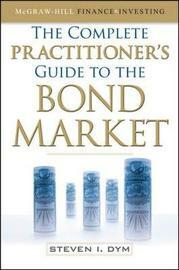 A comprehensive, practical guidebook tobonds and the bond marketSpeaking directly to the practitioner, this thoroughguide covers everything there is to know aboutbonds-from basic concepts to more advancedbond topics. The Complete Practitioner's Guide to the Bond Marketaddresses the principles of the bond market and offersthe tools to apply them in the real world. By tying theconcepts of fixed-income products to big-pictureaspects of the economy, this book prepares readers toapply specific tools and methods that will help themglean profits from the bond market. Steven Dym is a president of a US investment management firm, Mariner Capital Partners. His articles have appeared in various publications including the Journal of Portfolio Management, Financial Analysts Journal, and Risk Magazine.